Join the Tahoe City 4th of July celebration! 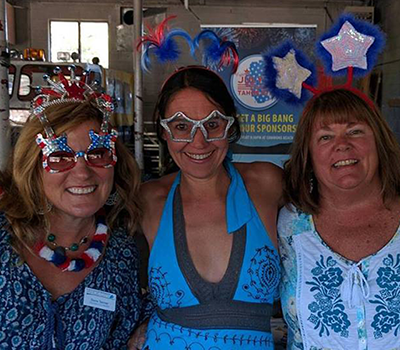 Get patriotic and raise money for our Dyno-Mite Big Bang Tahoe City fireworks show! Volunteers are needed to collect donations and sell t-shirts and merchandise. Several 2-4 hour shifts are available from 9:00am-4:00pm on Wednesday, July 4th at Commons Beach and North Lake Blvd. in Tahoe City. The opportunity can be used as part of a community service project. Festive attire is encouraged! This is a super fun day with live music, food vendors, and a patriotic atmosphere. And, of course, don’t forget to stay for the fireworks! Please contact Dana Tanner Powell for more information (Dana@visittahoecity.com or 530-386-3016).